Picturesque coasts, green landscapes, sun-dappled beaches, authentic cuisine, interesting customs and traditions – there is much more to Spain than Barcelona, Madrid, Bull-fighting and Tomatina festival. Enjoy the offbeat and unseen side of Spain on unique tour with SelfRoadiez. Spain is a country that offers a multitude of options. It has a vast and exciting cultural, natural and gastronomic heritage. It’s a place where you can wander around modern cities, and cities that will take you back in time to a different age. You’ll fall in love with its climate and its people. Immerse yourself in a culture with an ancient history. From the archaeological sites at Atapuerca in Burgos to the Alhambra in Granada. Spain is the country with the third largest number of UNESCO World Heritage sites. The variety of Spain’s natural spaces makes it an outstanding setting for anyone with a spirit of adventure. From north to south, you’ll be amazed by the diversity of its landscapes. Spain is the country with the most UNESCO-designated Biosphere Reserves in the world, and it has no fewer than 15 national parks. All this and much more is waiting for you in Spain: a country that welcomes visitors of all descriptions. Come with us as we take a look at its main attractions, and let yourself be charmed by the openness and friendliness of its people. Spain is incredibly diverse, both culturally and geographically. The south and north are worlds apart. One is a hiker’s paradise, and the other more for the city slicker. It is suggested to visit at least 2 regions to get a taste of the diversity in this country! Moreover, do not forget to explore out and visit the charming villages and countryside that make up Spain’s beauty and culture, away from the tourists. treasures designed by Antoni Gaudí, like the Sagrada Familia and Güell Park. It also has Roman remains and medieval neighbourhoods you can wander through and discover its history. and charming markets, await you. Andalusia is a large autonomous region of hills, rivers and farmland bordering Spain’s southern coast. 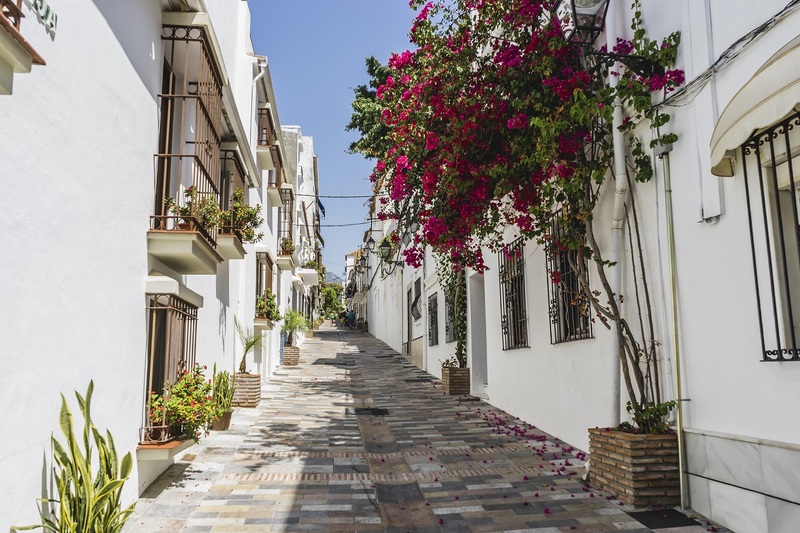 If flamengo dance, villages with white streets, architecture and buzzing tapas bars excites you, then Andalucia is the place to be. At the foot of the Sierra Nevada mountains, between the rivers Darro and Genil, lies one of the most interesting cities in Eastern Andalusia. Fountains, viewpoints and “Cármenes”, houses surrounded by typical gardens of this city, create unforgettable corners in the city. It is no surprise that one of its old neighbourhoods, the Albaicín, has been awarded the World Heritage designation, together with the Alhambra and Generalife. Situated on the banks of the Guadalquivir River, Seville has a rich Moorish heritage, and used to be a prosperous port that carried out trade with the Americas. Museumsand art centres, theme parks, cinemas, theatres and clubs are some of the many leisure options that a great city like Seville holds. Without forgetting, of course, the numerous terraces, inns and bars where visitors can practise one of the most deeply-rooted and tasty traditions in the city: “Going out for tapas”. Its capital, Santiago de Compostela is the final destination on the Way of Saint James, the famous pilgrim route. For this reason alone it is worth visiting this region in Green Spain. You’ll love its landscapes full of green wooded valleys, and its amazing beaches. All along the length of its coastline, bathed by the Cantabrian Sea and the Atlantic Ocean, you’ll find areas of spectacular cliffs like those on A Costa da Morte, or the incredible Islas Atlánticas National Park. You can visit its numerous charming villages, both on the sea and inland, and cities such as Santiago de Compostela, A Coruña, Ferrol, Lugo, Orense, Pontevedra and Vigo. Asturias has 18 fishing villages immersed with rich ancestral culture and scenic beauty with their ports, markets, cobblestone streets and great fishing tradition. A walk through the Asturian culture is a trip back in time through the centuries. Asturias is the origin of rural tourism, a way of travelling that is rooted in the authenticity of the towns that safeguard its traditions, that are proud of its landscapes and that don’t understand a world without hospitality. Asturias is primarily nature: woods, beaches, summits, cliffs, lakes, rivers, caves etc. Basque Country (Euskadi) is an autonomous community in northern Spain situated on the Atlantic Coast with strong cultural traditions, a celebrated cuisine and a distinct language that pre-dates the Romance languages. The scenic route from Bilbao to San Sebastián is an unforgettable road trip that leads you through a string of traditional fishing villages. In La Rioja, a small region huddled around the Ebro River Valley in northern Spain, it’s easy to feel a little dazed – Those rows of shimmering olive trees and gnarled vines that stripe each umber hill with silver and pale green; Those walled medieval villages whose ochre-tinged castles crown the tallest bluffs; Those pale blue skies where steely clouds swirl on breezes kicked down from the jagged Cantabria Mountains that hover above. It’s a fairytale backdrop, a faded page from a storybook suddenly come to life. Madrid, the capital of Spain, is a cosmopolitan city that combines the most modern infrastructures and the status as an economic, financial, administrative and service centre, with a large cultural and artistic heritage, a legacy of centuries of exciting history. Madrid has many artistic attractions, thanks to the different styles that have left their imprint in the city over the centuries. An art lover’s paradise, Madrid boasts of a collection of exquisite artworks by Spanish and other renowned painters across it’s museums and galleries. Madrid has embraced the gastronomic evolution of Spain and is a culinary capital of Europe. Madrid also reflects the rich architectural heritage of Spain in it’s attractions and buildings. Visit to Madrid is not complete without a one or two-day trip to any of the wonderful places that surround Madrid, from UNESCO World Heritage Sites to charming villages and magnificent palaces. A Phoenician-Punic settlement during ancient times, Ibiza contains within its Renaissance walls an interesting legacy from all the different cultures that populated it. This artistic wealth is found in the monumental area of Dalt Vila, in the necropolis of Es Puig des Molins and in the archaeological site of Sa Caleta. The beauty of the island capital is enhanced by the sands and coves at Figueretes, Es Viver and Talamanca, as well as by its the diverse marine ecosystem. Crystal-clear waters, pristine beaches, natural coves, otherworldly scenery – The Ibiza coastline is marked by one of a kind, awe-inspiring places to enjoy the beach and sea all year long. Taste a paella or take in a seaside concert, ramble down the coast by boat or kayak, go scuba diving or try all manner of other water sports. Or simply dig your feet into the sand and watch the sun go down. The options are endless. Carob, fig, almond and fruit trees are joined by vineyards in populating the Ibizan countryside and imbuing it with a sense of peace and escape from the hustle and bustle. The setting calls for a slower pace, like from bygone times, when the only reds were those of the earth, the greens of surrounding vegetation and the blue of the sky above. Have a basic understanding of the different regions and their culture/traditions. There are many semi-autonomous regions in Spain and there are pro-independence movements in few. So it would be best not to initiate any discussions on that front. Understand “Siesta” – Certain regions in Spain (the hotter ones) and certain seasons (*summer*) take an afternoon break to escape the heat. Staying Vegan – much of the Spanish cuisine is based on meat. Though Vegan restaurants are available in Madrid and Barcelona, in other places it might be tough to find.